* Hair Length: Fringe 5.5", Crown 7", Nape 1.75"
This short bob style grey wig with a tapered nape and hinest Heat Friendly Synthetic material. 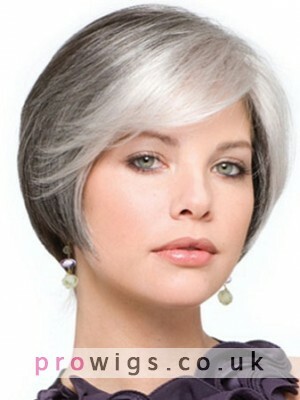 That is easily finger styled, and offers a wig cap with a weaving technique for excellent look. It"s a nice, quality-made wig. I had just expected it to be less shiny/synthetic looking. Also found it hard to have a natural looking park once I had straightened it and played around with it. Gorgeous wig as always, and it looks so natural! GORGEOUS gorgeous wig!!!!!!! Exceptionally beautiful!!!! Length, texture, quality ,colour all is perfect. I get so many compliments all the time. I have ordered my second one already. Wear it all the time. I took it to my hair dresser so my haircut and color would match my wig, this way when I don't wear it. People cannot suspect I wear hair products. It's real hair. Nice and thick. I was thinking it could be too heavy for me, but it seems to be fine. Got it in the same colour as my own hair. I did have to trim the bangs and style it.The picture doesn't do this wig justice. It's actually very pretty in person. It was a big jump for me in price, but it's worth it.I'm more satesfied with this purchase than my last one. I am in the long process of growing out my hair, I just stopped dying it 3 months ago and cut it really short because it was so damaged. I decided to get a wig. I just got this wig today and tried it on. I absolutely love it! It looks even better than the picture. To me it looks gorgeous!! The hair is perfectly soft. The top also looks like skin! You can see a part and the skin top, it looks so real. I am so happy with my purchase!